Today we are very thrilled to officially present the first 1/4th scale Iron Man collectible figure – the Mark XLII Collectible Figure from Iron Man 3! 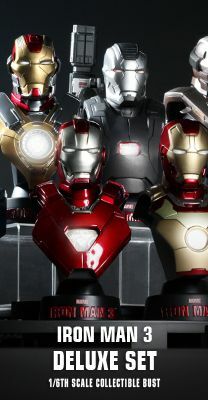 The movie-accurate 1/4th scale Mark XLII Collectible Figure is remarkably detailed and meticulously crafted based on the image of Robert Downey Jr. as Tony Stark/Mark XLII in Iron Man 3. 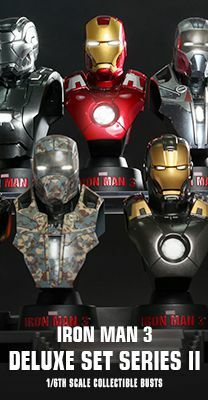 This collectible figure stands 49cm (20 inches) tall, featuring a newly sculpted battle damaged Tony Stark helmeted head sculpt, interchangeable helmeted head, specially applied metallic gold, red and silver colors on armor with weathering effects, a number of interchangeable battle damaged armor parts, a battery booster Tony Stark used to recharge the armor as seen in the film, LED light-up functions on eyes, arc reactor and repulsors, LED lights shine through various areas of armor. 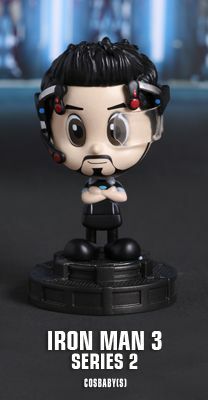 This deluxe version will exclusively include a specially designed Arc Reactor-themed figure base with LED light up function and detachable gantry arms. 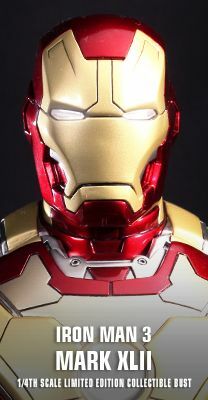 Iron Man fans shouldn’t pass up on the opportunity to add this incredibly detailed 1/4th scale collectible figure of the Mark XLII to your great collection!